This glazed corned beef recipe is the only one you'll need for a hearty family meal or St. Patrick's Day dinner. The spices flavor the corned beef brisket perfectly, and the brown sugar and mustard glaze is amazing. 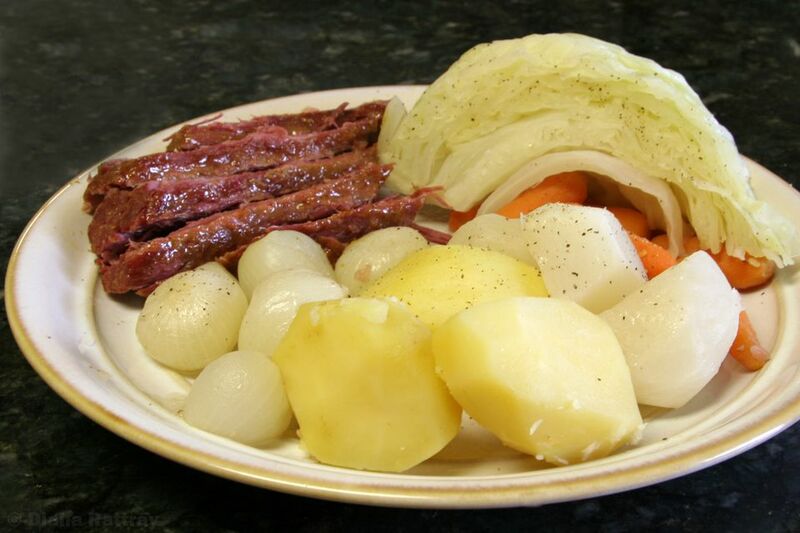 The corned beef is simmered with potatoes, cabbage, carrots, and turnips or rutabagas and then it's glazed and baked for 10 minutes. Feel free to replace some of the carrots with peeled and sliced parsnips, and rutabaga may be substituted for the turnips. See the tips and variations below for more ideas. Put the corned beef brisket in a large Dutch oven or stockpot and cover with water. Tie spices in a double thickness of cheesecloth or put them in a small bouquet garni bag. Add the spice bag to the water. Place the pot over high heat and bring to a boil; reduce heat to low, cover, and simmer for 2 1/2 hours. Add the potatoes, carrots, turnips, and peeled onions. Cover and simmer for 10 minutes longer. Add the cabbage wedges, cover, and simmer for about 15 minutes longer, or until vegetables are tender. (Cabbage can be cooked in a separate pan if you don't have room, in a small amount of salted boiling water.) Cover the pan and simmer for about 15 minutes. Continue to simmer the potatoes and other vegetables until tender. Heat the oven to 375 F/190 C/Gas 5. Transfer the corned beef brisket to a baking pan. Bake in the preheated oven for about 10 minutes, basting a few times. Transfer the glazed corned beef to a large serving platter and slice the meat. Arrange the cabbage wedges, potatoes, carrots, onions, and turnips around the sliced brisket. If using whole carrots, peel them, slice them lengthwise, and then cut into 3-inch lengths. Homemade Mixed Pickling Spices: Combine 1 tablespoon of whole mustard seeds with 1 1/2 teaspoons of whole allspice berries, 1 teaspoon of coriander seeds, 1/4 teaspoon crushed red pepper flakes, 1/2 teaspoon of ground ginger, 1 crumbled bay leaf, 1 crumbled cinnamon stick, and 2 or 3 whole cloves. Makes about 3 tablespoons. Add about 1 cup of cubed parsnips (1- to 2-inch pieces) to the vegetables, or replace part of the carrots with cubed parsnips. Replace the turnips with cubed rutabaga (1- to 2-inch pieces). Use small cippolini onions instead of boiling onions.